I work in Corporate America. I invest in real estate on the side. I am married with no kids. I am quite OCD, especially about organization. I have spent countless hours researching how other people use Evernote to 'remember everything' and 'get things done'. I have spent significantly more hours setting up this system than I have saved using this system. Hopefully that will change. Anyway, I wanted to share how I organize Evernote, which is really just The Secret Weapon (TSW) slightly tweaked for my personal needs. This system, in my opinion, limits decisions points (i.e., where should I put this note and how should it be tagged? ), effectively tracks action items through to completion, and allows me to save and organize everything else. !inbox - Everyone seems to have this one down. This is my default notebook where all notes start before being filed and tagged. Work and personal emails, webclips, random notes and ideas, etc. Case in point, I am writing this in a note that is currently in my !Inbox folder. Action Items (2) - This is a notebook stack for my notes that require action. There are two notebooks inside: Open and Complete. I'm sure you can guess what's in each. Cabinet - Essentially, this is a notebook for all notes that don't require action. I put meeting notes, receipts, webclips, etc. in this notebook. I only use tags for context. The tags answer where, when, and what. what - I use this tag for notes that go in the Cabinet folder. It helps me quickly find things like receipts, meeting minutes, templates, webclips, etc. Not all notes in the Cabinet get a what tag, but many do. TSW recommends a who context as well, but for me that was spiraling out of control quickly, so I nixed it. If a note is associated with a certain person, I usually just try to make sure their name is included in the note itself. I hope this helps at least one person out there! Glad you found a way to organize EN in a way that meets your personal needs. Some of your ideas are good but most of it has already been discussed here in great length. No argument here. As I mentioned, my method is essentially TSW. I love seeing exactly how other people use Evernote, even down the specific verbiage used and ordering of stacks, notebooks, and tags. Thus, I shared exactly how I use Evernote. Thank you for sharing! It's always nice when someone take the time and effort to show how they work with Evernote! For the when, I start my title with a date code (yyyy-mm-dd) followed by the location and topic. The Intitle: command helps find the date range notes I am looking for. I do have a battery of tags for where and what. I also use tags for who due to issues where search will not work accurately. But my tag "Gaddafi" finds all the different versions. 2. Honorifics instead of the name. In my use, a single tag:Obama finds notes and comments containing Barack, President, POTUS, Commander-in-Chief; and avoid notes about Michelle Obama. Many false hits turn up when a person has a common name like: Dean, Dayton, Richardson, or Warren to name a few. And if the titles are included, a search will become more tedious and less accurate. I can increase my accuracy by searching with a tag for the person. Are your tasks, etc. all coming from a single origin point primarily (e.g. Outlook, etc.) or ...? The challenge I run into is that all of my personal/freelance work is routed through Gmail, and my day-job is routed thorough an Exchange server via Outlook. I'm trying to find a good way to merge these together. Evernote is typically my dumping ground, but I find that I'm struggling to use it for task management. Yet at the same time I'm hesitant to try a different task focused app because I am not able to sustain keeping all of these platforms up-to-date. I tried IQTell, but found it slow and a bit more complex than I need. You can use the http://evernote.com/webclipper/ to pull things from your Gmail. It does a nice job of extracting the content in a simple and plain way and its context aware. It knows when your trying to clip an email and extracts pertinent information. It also has options for saving just one email or the entire thread or just a portion. And when you install Evernote on your computer it should come with the outlook plugin. You can use this to pull things from your outlook or exchange. If all else fails enter the information by forwarding the email to your evernote address . Make sure everything goes into an inbox notebook and once a week or how ever often you want to review look through each note and decide weather or not the perticular note requires a task for it and input it into what ever task management tool you want to use. If you need the email as a reference archive it and set a link to it from your task. Or if the task is self explanatory then just simply delete the note once your task has been created and organized. Thank you all for sharing as I am now looking to move from Outlook, Evernote, and what ever the flavor of the day is for Task Management.....to Just Outlook and Evernote. I am not a disciplined person and want to totally embrace a process. I will post when I have it setup and using. I am in the process of cleaning up my tags first. This is a gem, thanks a lot. 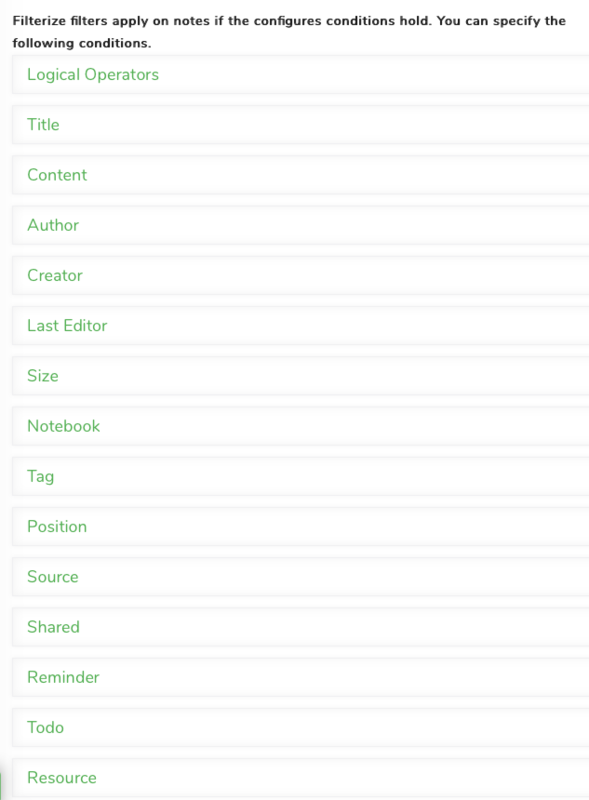 The only minus I've found is that the evernote android app seems to not handle nested tags. I think, I would have problems with this system. Sometimes I make a notebook for a specific topic and share this notebook with my wife. For example when we plan our holidays. So we both can put notes with ideas, informations, packing list, ... in this notebook and both of us have access to this notes. If I would throw every note in "Cabinet", I would have to share every single note to my wife, if it's in the topic (my wife have an other structure of notebooks and tags in her Evernote). I understand having a Notebook that is shared with your wife. However, why does the notebook have to be restricted to a single topic? In my organization, I would have the Notebook, and various topics identified by tags. You mentioned planning your holiday. Will she have the same tags, that I created in my Evernote? Ah, sonds good. Can she create and apply tags for this one shared notebook? Ok, thx. I don't think, this will work for me. In this case shared notebooks, each for one topic is easier to handel. So my wife can create and move notes without asking me to create tags. I know that you have posted this 2 years ago, but I would just like to share that if you are using Gmail, you can empty your inbox without using Outlook, you can still use Gmail and use an IFTTT recipe that whenever you label an email or multiple emails as "evernote", it will automatically create note/s in evernote. That is what I consider my modified TSW. - In the case of the email with the report that i use as example. Should I create 2 additional notes for each action or add text to email note in Evernote? - Do you keep all the emails in the "Action Items" notebook until the project is complete? I wonder if you have experience this scenario. Any suggestion is welcome. Sometimes, it's one-to-one with a task, so that's easy. >>Do you keep all the emails in the "Action Items" notebook until the project is complete? I would forward the email to my Inbox in EN with the appropriate action tags added to the email subject, and a reminder if need be.. I would add a line per task at the top of the email (above the original address) to represent whatever tasks. Then when I got to my inbox to "clean-up", I would decide whether to just put check boxes on the task(s) or create a note for each task linking back to the email. It depends how closely the note title matches the action(s) or if the timing of multiple tasks varies. And then move the note(s) to my prime notebook. Like @DTLow I use tags as opposed to notebooks. I have a Phrase Express hot key which puts _Completed yyyy.mm.dd into a note when I complete the task, and remove the TSW tag and just leave everything in the same notebook.. There are a many deployments of GTD and TWS using EN. Look for what works best for you. Some folks say don't even bother and go to a specific app. I developed my own method since I like my stuff in one place. FWIW.. Thanks @DTLow and @csihilling. I just have three notebooks Cabinet, Pending and Completed and several tags as described in TSW. As you said the one-to-one task -email are easy. I think what scares me is that the Pending notebook starts growing fast. As I supervise some people some of the email are tag as 6-wait as I need someone else on my team to do something. Usually when I move something to complete for me is done, nothing else to do on that particular email but the project still have things to be done. I will keep trying. I thinks that moving from folders (notebooks) to tags is a mind set change, one single folder is full of stuff the tag filter starts to put some order. You are welcome. Tags have worked better for me, and the incorporation of reminder dates when hard deadlines exist. I know it means I am sometimes looking at the backlog in two ways, !1-Now and date, but it seems to fit how I think. Keep working it until you have the process that fits your thinking. If you have a lot of pending build up, you might want to consider how you are controlling those tasks. Do the assignees not know the priority, understand the task? Do you need new assignees? What are the right action steps to shrink that backlog. FWIW. Tags have worked better for me, and the incorporation of reminder dates when hard deadlines exist. This post is very informative and provided me potential new ways to use Evernote. I do pay for the premium service and contemplating business. I read the entire thread to avoid asking a "rhetorical" or duplicate question. I don't "post" many questions online unless having exhausted all known research options. I use Evernote slightly different where my job requires extensive amount of research whether online books (Safari Online and Kindle), videos, Internet searches, Google Alerts (alerts.google.com), RSS Feeds (InoReader), and more. Majority of this being web based, websites. After 20 years in IT I've become "last resort" in many situations after other teams and the vendor fails to fix the problem. To achieve this required a lot of "moving" where I took roles that kept me out of the pigeon hole and allowed me to learn Windows Technology, then Networking, then IT Security, on to application development, and even highly specialized products such as Citrix, VMware, Hyper-V (Hypervisors). This allows me to "follow the packet" and go wherever it goes and no matter what I find and fix the problem. In web site references alone I have approximately 9000 Notes if not mistaken? Across all those and other areas mentioned above. So this is how I predominately use the product which I felt I should share as everyone else has on this thread before asking any questions. To put 9000 notes in perspective I'm fairly new to the product. Less than two years. Incredible potential. I have others but I don't want to waste more of your time. I'll post them later on. Take Outlook for example, direct integration, you can "forward" an email to Evernote and being you can modify the subject or header information very easily have what I refer to as Dynamic Notebook. Even better, you can create a "Rule" [Advanced Rule] in Outlook to automate that process. I don't think I read this in the thread but very useful. Simply click on your Inbox, then an email, a specific person, a specific subject, there is even an option to look inside the "Headers" and automatically have all those emails forwarded to Evernote and it works because using Advanced Rules allows you to add variables to the subject line just as if clicking the forward button. If you want to know more, let me know. I'm in IT so I maintain Google Business Accounts, and Office 365, and others. What I just described above is not possible with Gmail, one example. You can create "Rules" for "Tagging" email and you can even add Evernote address to be a forwarder. Problem is, there is no way to automate or modify the Subject Line. If I want to sign up for NIST.gov security alerts with Evernote address it goes to First Notebook. Then I have to manually move it. This can be resolved, IMO, with Dynamic Notebooks where you can define criteria beyond a top level name. Whether LinkedIn, Microsoft Updates, Forum post updates, I would like to send those to Evernote and find a way to automate moving those specific emails to specific Notebooks but where I have no ability to modify the subject line or add variables. I'm going to use Advanced Rule in Outlook, send it to email1.abc.com (me). Create a Rule that does immediate forward but this is not as easy as it sounds. I cannot do immediate. Why? I lose the chance to Tag subject line. So for now going to right a script (Powershell) and Advanced Rules that first send a copy of the email to a staging folder, then tag it, then forward it. Sounds easy but it isn't and if Outlook is closed it won't work being Client Side rule only. find a way to automate moving those specific emails to specific Notebooks but where I have no ability to modify the subject line or add variables. Okay, well that is what I figured given the research I've done. Appreciate the validation. I will take a look at Filterize. I thought perhaps an application (apps.evernote.com). My Outlook method appears to be working but too mechanical. I've already automated / created applets where I created specific worded alerts using alerts.google.com. Simply star any message in Gmail, and save that email and its first attachment as a new note in Evernote. Each starred item will be saved as new note. The configuration includes the ability to set the NoteBook Name.